Throughout the year, but especially in the Spring, we see a lot of new litters in need of help. Many of them come to us without a mother. For these babies to survive, they need human care around the clock until they are able to feed and use the litter box on their own. They also need the warmth and touch of a loving person. If you have experience with infant kittens and want to help HHPR with their care, please contact us. 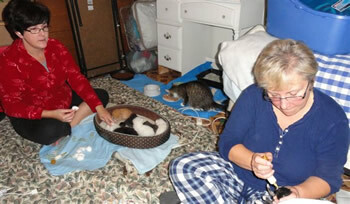 Kim and Carol Austin care for orphan kittens. We seek volunteers to be trained as orphan kitten care providers. We will provide training that will cover basic care, feline stages of development, and medical issues. If you are interested in becoming an Orphan Kitten care provider, please contact us. You may call 999-1075 or complete the form below. We also seek donations to help sustain this program. Your donation will be used to purchase kitten formula, nursing bottles, cotton balls, blankets, warming areas, medication, and more. To learn more about the care of orphan kittens, visit Alley Cat Allies.